Whether you sell online or like to print online information, you've probably thought twice about clicking the print button or contemplated if you should or should not include a receipt in the order. As an online seller I totally advocate going green, but in reality most people expect to get a receipt with their order. Some sellers figure if the customer wants one they can print it themselves; well, not all buyers have printers (I find it hard to believe, but yes, there are printer-less people in this world!) As a buyer, I am put off by having to print my own receipt with my own ink and consider this to be a cost of doing business; a burden which should be upon the seller in my opinion. Ink and paper cost money, but one thing you can do is reduce the use of both by taking advantage of the features on your printer. 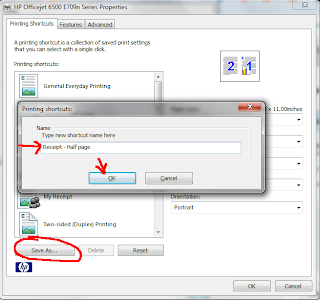 This little tutorial type explanation is based on my own personal settings and printing habits with my HP Officejet 6500, but I'm sure in this day and age most modern printers have some sort of ink saving features that are well worth looking over. I've had this particular HP for 2+ years. I print everything for my online shop on it - and I mean everything; iron on inkjet sheets, transfer paper, freezer paper, card stock and of course regular office paper. This printer has served me well! In this photo above I'm on the "Features" tab. I got to this tab after selecting "print" and then the "properties" tab. On the right side are paper saving options. 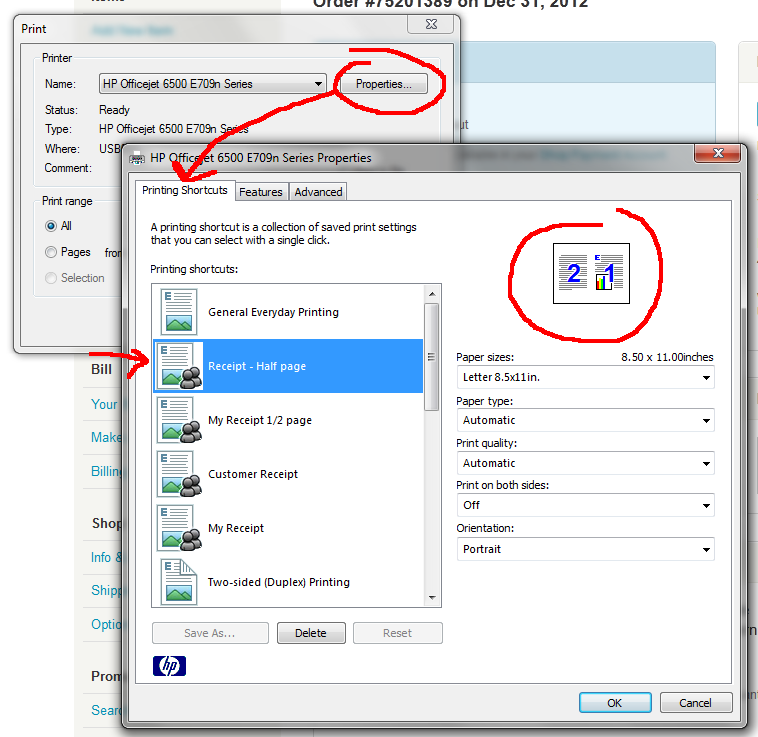 I've circled in red where I selected the 2 pages per sheet and left then down for the page order options. 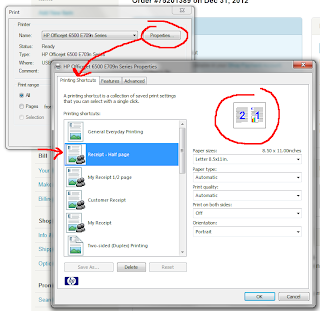 After you select 2 pages per sheet, you will see the paper set up icon (blue arrow) change. 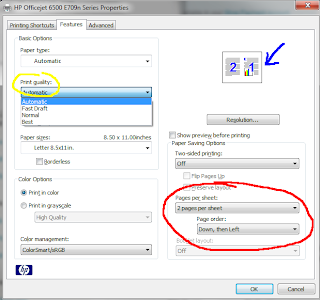 Select your desired "Print Quality"; I want my customer to get a decent looking receipt so I select "normal", BUT I turn down the ink which I will show you next. In this picture, I am now on the "Advanced" tab. 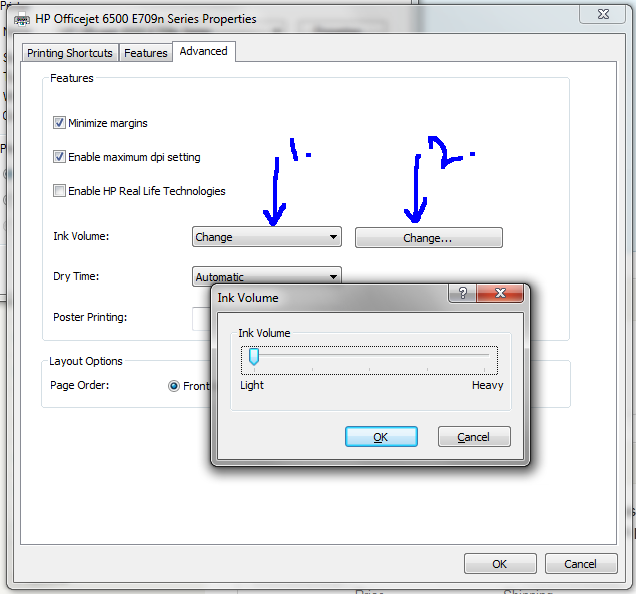 The "Ink Volume" is by default on Automatic. Clicking on the Automatic button allows you to select "change" (labeled as 1. above). 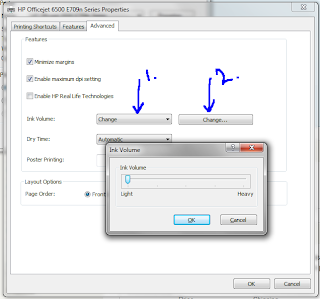 By selecting "Change" a second "Change" box appears and when you click it a little window with a slider opens allowing you to further manipulate the amount of ink you use for that print job. I slide it to the lightest setting. 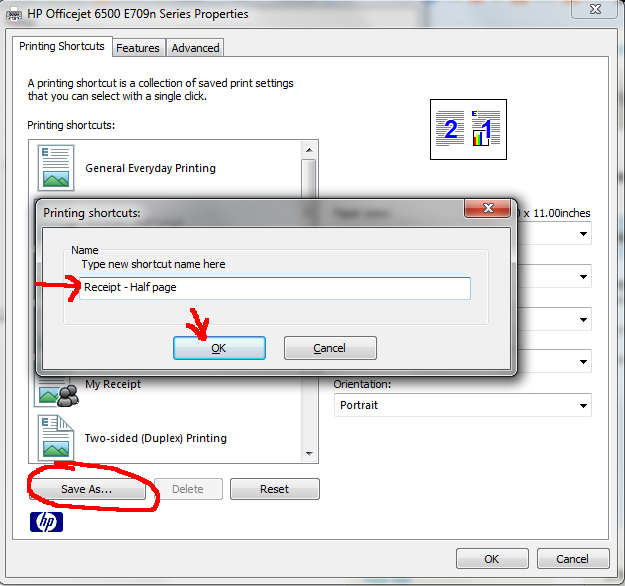 If, after you've made these change you want to save these settings to use for future print jobs, go back to the "Printing Shortcuts" tab and at the bottom click "Save Setting". A window opens for you to name your setting. So now, as shown in the last picture, I have saved those settings for future use! I've been printing a 1/2 page receipt for myself too for which I set the print quality to fast draft and again turned the ink volume all the way down. 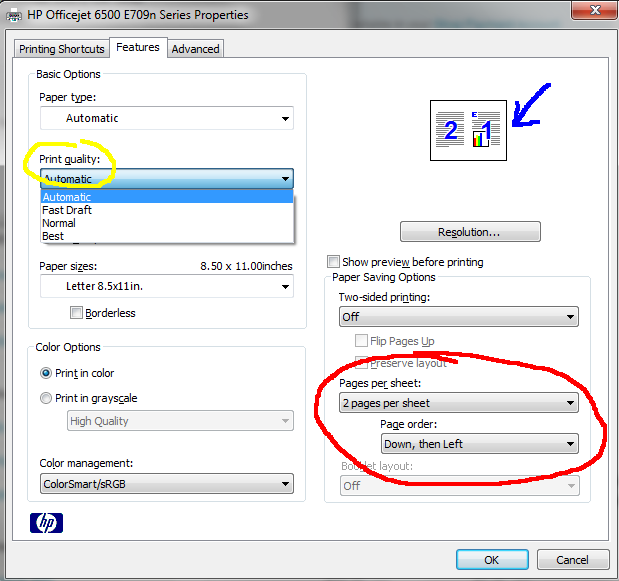 FINAL NOTE: to print 2 receipts per page, after the first one prints reinsert the paper blank side first. I print both my receipt and my customer's on one page then cut them on my cutting board. PayPal receipts will print with the paper already cut in half, but I can't seem to get my Etsy receipts to do that so I have to print them on one page then cut them. Looking for more ways to use the paper the receipt is printed on? I cut the blank strip at the bottom off and use it to make my matchbook style "thank you" memo pads. The customer's receipt doubles as a place to write a short thank you message.